Many purchasers suggested that the Vans Mono Canvas SK8-Hi makes for an excellent spring and summer sneaker. One customer is stoked that this high-top matches well with everyday clothing. Some commented that it only took a day of wearing the sneaker to break in. The Vans Mono Canvas SK8-Hi is a great gift option for any gender as stated by many buyers. Majority of the buyers commended the shoe for being comfortable to wear. A couple of skaters advised that this sneaker grips well while on a skateboard. This high-top’s design is stylish enough to earn compliments from friends and peers as per some wearers. The Vans Mono Canvas SK8-Hi’s color schemes look fantastic as mentioned by a few testers. A handful of buyers warned that the sneaker becomes dirty easily. The shoe’s durability is questioned by a customer as the soles were coming off after a few months of usage. The Vans SK8-Hi has been around for decades, but the people’s appreciation for its classic silhouette never seems to diminish. 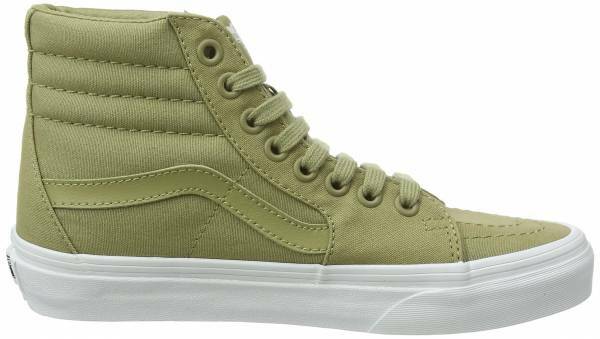 As one of the recent update for the timeless high-top, the Vans Mono Canvas SK8-Hi possesses all of the distinct elements of the original but this time with relatively monochromatic colorways and canvas uppers. As affordable as any shoe can get, there aren’t many reasons not to secure a pair. Since the 70s, the SK8-Hi has been a predominant gear for skateboarders making it one of Van's most iconic sneakers. This classic is only the second model that features the "jazz stripe" which was just a random doodle by founder Paul Van Doren but later known as the trademark symbol of the company. Following in the footsteps of the iconic Old Skool, the SK8-Hi became a fixture on the residences of the Anaheim, California. Together with other Vans Classic styles, the shoe is recognized as a quintessential representative of the Sidestripe aesthetic and the Vans brand in general. It was initially referred to as the Style 38, the SK8-Hi features an innovative style which catapulted the skate functionality to a new concept - above the ankle. Not only did it protect skaters' bones from skateboard flipping, but it also introduced a new look to the community. During the 80s, customization is one of the trends in line with bizarre hair and lifestyles. With merely designing an art with a pen, one can own art-to-footwear utilizing the SK8-Hi's style and its extended drawing exterior. Because of the idea of shoe customization, people became enamored with creative possibilities until today. The concept of personalizing their beloved Vans shoes with the art of their own making will always be something to go for. The Vans Customs program offers the customization of the SK8-Hi with the newest prints and colors since 2014. The public’s desire for owning a SK8-Hi further bolstered when it became one of the favorites of sports action figures like BMX champion Dakota Roche and celebrated skateboarder John Fitzgerald. A testament to its timelessness, the sneaker became popular worldwide since the 2000s. An all-purpose style to match the riders' appearance and a functional gear to their craft, the SK8-Hi is a natural choice. Today the Vans SK8-Hi maintains its stature on the market through numerous collaborations and presence in sports and fashion. As one of the updates of the vintage sneaker, the Mono Canvas SK8-Hi offers the new generation a piece of Vans heritage with the same silhouette, comfort, and functionality that represents what the company is about. As with the case of other SK8-Hi models, wearers of any gender for various functions will find no issues with matching their high-top Vans Mono Canvas SK8-Hi on their casual clothing. Its versatile classic design and relatively monochromatic colorways deliver a pristine look. It also offers a nice spring-summer vibe, as it is mostly complimented when paired with skinny jeans or shorts. Due to its high-top construction, ankle support can be expected while the lace-up system provides a snug fit for both walking and skating. The canvas upper helps the sneaker be breathable and lightweight. The Vans Mono Canvas SK8-Hi is offered in US men’s sizes from 3.5 to 11.5 while women can avail from 5 to 13. To withstand continuous use, re-enforced toecaps are featured on the Vans Mono Canvas SK8-Hi. Its padded collars contribute to the sneaker's flexibility and support while the rubber waffle outsole delivers the necessary traction while on or off the skate. There are over 100 collaborative works that are associated with the Vans SK8-Hi. With the exception of the colorway Peach Blush, the outsole for the Vans Mono Canvas SK8-Hi is consistently white in color.